I have random pictures on my iPhone. Take, for instance, this lovely looking picture of Trader Joe's Garlic Fries. I don't remember taking it. It might have been a few weeks ago when we had them last. It might have been any one of the several times Sandy and I munched down on them over the past couple years. About a year ago at this time, we were eating a lot of fries. Pregnancy and sympathy can certainly do that. While we favored the sweet potato frites, these were a common-enough pick up...I think her watching the Twilight movies and her strong desire to not have a vampire baby might have had something to do with that. Eh well. Stumbling across the picture was a little bit of providence, as our latest trip to TJ's produced much of the same staples as usual without much of anything new to review, so here we go. They're not bad. These fries are the type with a little extra batter on them to make them a little extra crispy and greasy even straight from the oven. They're also pretty generously cut. I approve of that. I'd recommend baking them a little longer to make sure they're a little extra crispy, because the garlic goop comes in a little pouch on the side that you swish your fries in a bowl once baked. That leaves the potential for a plateful of limp, very non-crispy fry. That's not good. That brings us to the garlic sauce...it's decidedly very garlicky. You've got to like roasted garlic to like these, because man, it's strong. We've used the whole pouch and have found that the "less is more" approach works better. Also, in retrospect, I wonder if drizzling the garlic oil on the fries then baking for an extra couple minutes might not be a bad approach to try and avoid the inevitability of a few less-than-perfunctory spuds. Anyone try that method? That biggest gripe I have, though, is if you follow the instructions and pay attention to the labeling, you have to bake the whole bag at once (I guess because of the one pouch of oil), and that's seven servings. Maybe that works well for the seven dwarves, but for just me and the wifey (Baby M's still a bit too young), that's a lot. Granted, I think the serving sizes are small, because, um, well, we can eat the whole bag (not that we should, but we can). There's probably some sort of creative solution that doesn't involve reheating them, because that's gross. Also, it'd be preferable if it involved not storing the excess oil in my fridge, because knowing us it'd end up going bad and making a nasty piece of Tupperware we'd fight over cleaning up (I always lose those). 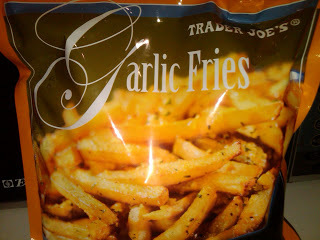 To wrap it up, the Trader Joe's garlic fries aren't necessarily fantastic, but they're not terrible either. I'm "borrowing" the packaging picture from a veritable fry expert, French Fry Diary, and their review, while a bit more harsh than ours, isn't too far off the mark either. They're not bad, and they're worth the occasional pick-up, but not much more than that. Split our score as you see fit. If I recall, I just made the amount I wished to eat and stored the garlic packet in the freezer. No need for tupperware. Just wrap in foil or plastic wrap. I agree, they are very garlicky. I love garlic but this was maybe too strong.